New Delhi: India welcomed a pledge by Britain Thursday to end "complacency" towards its former colony and forge a special relationship, which ministers said would translate in coming years into economic benefits for both. Britain has lost market share in India in recent years, slipping to eighteenth biggest exporter to the country in 2008-2009 from fifth in 2002-2003, and a large delegation flew in this week to try to reverse that trend. "There's been a certain amount of complacency in the past ... a belief that sentiment was enough," Vince Cable, business secretary in a new coalition government that came into office in London in May, told ministers and business leaders in New Delhi. Cable said it was time for Britain to "understand and respect that India has made enormous changes", and offer Indian business partners the investments, exports and technologies that met the expectations of modern, tech-savvy India. 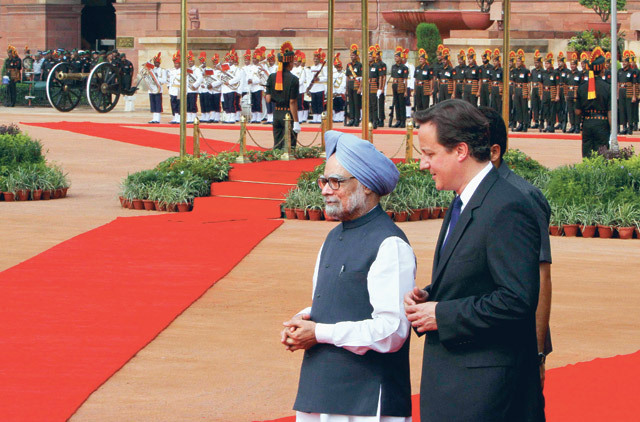 Prime Minister David Cameron brought six cabinet members and more than 30 senior executives from leading British firms with him, in what Indian media described as the biggest delegation to visit since independence from Britain in 1947. "India and the UK have a relationship which is distinct, which is very special," said trade minister Anand Sharma, adding that the size and seniority of the British delegation had "registered" with Indians and generated "enthusiastic interest". Ministers from both sides, taking part in a panel discussion in front of an audience of Indian business leaders, said the test of whether the new "special relationship" added up to more than just words would be whether trade and business ties grew. The stakes are greater for Britain, which is struggling to emerge from its worse recession since the Second World War, than for India, which is enjoying strong growth and stands to reap benefits from increasing trade flows between emerging markets. Bilateral trade was worth $12.5 billion (Dh45.9 billion) in 2008-2009 — an amount dwarfed by what Britain trades with Ireland, a country of about 4 million. A first result of the British visit was a contract worth more than $1 billion for defence group BAE Systems and engine maker Rolls-Royce to provide training jets to the Indian military, signed on Wednesday in Bangalore. 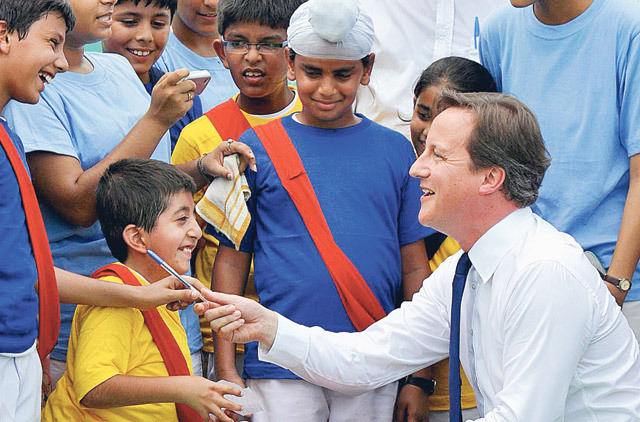 Yesterday, the focus moved to more traditional forms of diplomacy, with Cameron meeting a series of politicians on a hectic day in New Delhi. 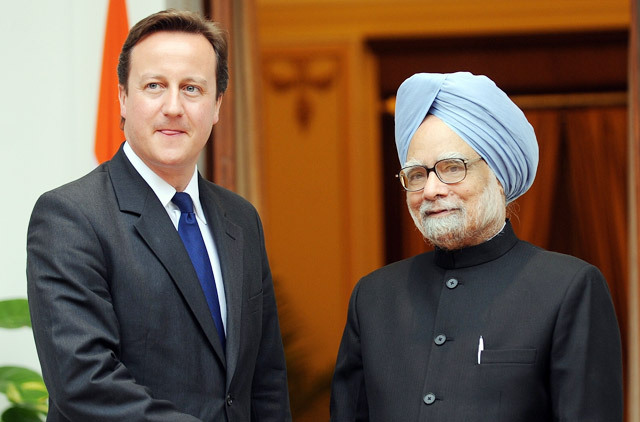 He met his counterpart, Manmohan Singh, in the evening. The new British government, a coalition of Conservatives and Liberal Democrats, has made clear it thinks the previous Labour government had focused on other foreign policy priorities to the detriment of ties with India, a long-time friend and ally. With Britain planning deep cuts in public spending to rein in a bulging deficit, the coalition wants to focus on fast-growing economies like India to tap new sources of growth. Asked whether a visit to India just 13 weeks into the life of the new government might send the wrong message to China, foreign secretary William Hague said ties with India needed more nurturing. "The Labour government did quite a good job of relations with China so there's strong foreign policy continuity there. With India there's a greater need for reinvigoration," he told reporters.